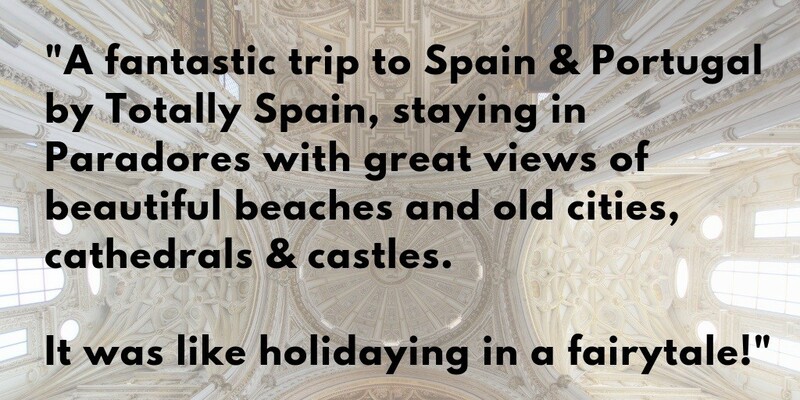 Book your trip with us to Spain & Portugal! Inspired by the interest in Bilbao’s Guggenheim, we founded Totally Spain in Northern Spain in the year 2000 and we’ve been booking expertly-designed, non-touristy, high-end trips for clients ever since. We’re not a booking engine that churns out trips. We’re a team of expert travel planners resident in Spain who know Spain & Portugal intimately having spent countless hours on the road here both for work and for please. Insider knowledge counts in the big cities and also in the smaller boutique destinations. Why not save yourself a lot of time researching, and tap into our two decades of expertise? Because we pre-book the key sights, you never have to stand in a line. Because we anticipate busy places and busy days, you never get stuck in airports or traffic. Because we recommend fantastic tapas bars and restaurants, you never have to waste time on wandering around trying to find somewhere decent to eat. Don’t you want to enjoy your time on vacation – rather than spend your time researching what to do? Totally Spain’s headquarters are here in Northern Spain. Not only do we ‘speak the lingo’ and live here with our families, we are constantly developing meaningful relationships with new hoteliers, restauranteurs, private guides, drivers, activity organisers and more – which means our tailor-made itineraries are always evolving. And clients love having us in their time zone while they travel. They know it’s easier to make a tweak to an itinerary when we are nearby. You know what it’s like when you book everything yourself. You’ve got multiple emails from the car hire people. Tons of emails from each hotel. You can’t find the pdf with the tickets to the Prado. And you wish you had time to research tickets to a wine-tasting but you’ve run out of time. 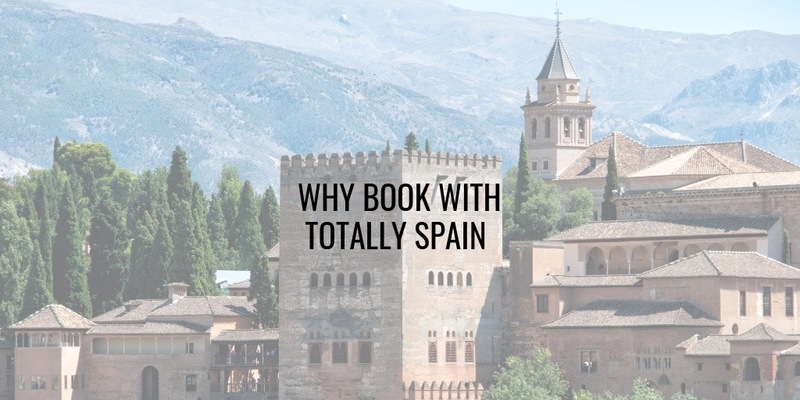 If you book with Totally Spain, you will only ever have one person to deal with for everything. And we mean everything. [Hotels, restaurants, car-hire, rail tickets, drivers, food tours, wine tastings, cooking classes, city tours, museum tours, flamenco shows, jazz concerts and anything else you can think of.] You only need to remember one name and keep track of one email address. How easy is that? Everything else is sent to you in a handy pack before you travel and if it needs to be replaced we can email or courier it to your hotel. Want to know about Spain’s unmissable dishes, the best travel apps, where to shop and what to tip in Portugal? Nothing is too much trouble for us. If you have a question or a request, we’re here to answer it for you. 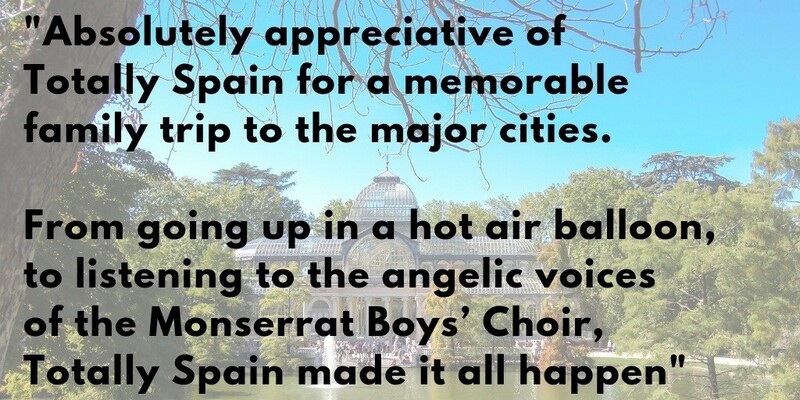 Chances are we’ve even published something about it here on our Totally Spain Travel blog. When you book a trip with us, you know you get our undivided attention. We don’t do anything else and we don’t handle trips for anybody else. We don’t sell property. We don’t own hotels. We’re not driving around the countryside in a camper-van. We only plan custom trips. And we do it 24 x 7 x 365. There is no better way to get a sense of a place than by meeting up with a local expert – and we make sure we have the best experts on our books for every destination. It’s one of the reasons clients say they return to us – they cherish experiencing places with our guides and drivers – who don’t just enlighten you about the destination, but they also offer wonderfully personal insights into living in Spain & Portugal – which makes the experience stay with you for so much longer. You get to choose the places, dates and everything else. We customise the trip that you want. If you want to start on a Monday and leave on a Thursday – that’s perfect. We will obviously advise you on where is best to be on any given day – but we’re not stuck to any schedule or dates that will impact on your treasured time. Although it’s much more time intensive, we always create new meaningful and authentic trips for each and every client – there’s no copy & paste in our line of work. We always add in extra creative elements that personalise the trip. For example, we love encouraging our clients to try out their hobbies here – whether that’s cooking, horse-riding, biking or painting. And when we have themed-tours, we really go to town (check out our architecture, winery and gardening themed trips). How do we customise? We ask you about your hobbies, interests and familiarity with Spain & Portugal from the get-go (as you can see in this list of prompting questions). Armed with lots of info, we hit our extensive contacts database to create a highly-tailored completely unique experience. Get in touch and we’ll show you just what we mean. Is everybody in your group arriving from a different location and on a different day? Are some splitting off on separate sub-trips? Any dietary requirements, mobility issues and multi-generational dimensions to factor in? Nothing phases us when it comes to travel planning – we’ve planned for every special interest group and family dynamic imaginable over the past two decades. And because we like to work 3-6 months in advance – we can provide solutions to potential complications that you won’t even have considered. All that matters to us is that you experience Spain and Portugal as you want, stress-free. Spain doesn’t always come out on top when it comes to great customer service (Portugal is much better in this regard). We can’t change Spain’s culture but we can make sure to only work with hotels, guides and drivers that provide great customer service and go the extra mile. And because we treat our service providers so well, our clients are fast-tracked and given special service whenever possible. Our clients always commend us on this. Have a special event to celebrate while in Spain or Portugal? We’ve created really personalised wedding proposals, honeymoons, romantic getaways, anniversaries, birthdays and tracing of ancestral heritage. If you have a trip in mind that requires something a little bit special, get in touch – we’d love the opportunity to work with you and create an incredible trip. 15 Technology is great but PAPER is pretty handy too! Nobody loves email, apps and SatNav as much as we do but there are times when pen and paper rock! Take our documentation packs, for example. How many agencies do you know that send out a detailed documentation pack to every client’s home before departure? Very few, we can tell you! Our pack features a Totally Spain city-guide for each location, and customised city maps. We put a physical ‘x’ where the client’s hotels are, and circle all the other important meeting points for that destination. We do the same for driving holidays and mark out the itinerary on a map. We also include a day-by-day written itinerary which details what’s happening when and provides all the contact information a client needs. We create this pack because it’s highly practical and helps ensure our clients have a smooth trip. They can easily find where they need to be, at a glance, and see who is meeting them throughout the day. We price every single trip for every single client so when you get a quote – it is for your trip – not somebody’s else trip last week or next year. And your quote factors in all the special rates, discounts, deals and upgrades which we know about because we’ve been doing this for so long. When you receive our quote, you can be confident that it’s always competitive and above all, great value for money. So, don’t be apprehensive about requesting a quote. Rest assured that we understand the importance of a satisfied client. We want you to travel with us again and to refer Totally Spain to your friends and family. Totally Spain Limited is proud to be an independent family-run specialist in a travel industry of mergers and conglomerates. Totally Spain Limited is a licensed and bonded Spanish travel company which protects each of its clients by fulfilling every legal, financial and insurance obligation required under Spanish law for retail travel companies. Furthermore, each of our providers have been inspected and are approved by the relevant authorities. Posted in The Travel Industry, Totally Spain and tagged custom travel, Portugal, smooth travel, Spain, tour operator, travel agency, travel planner.